LUCKNOW, Aug 27  Prime Minister Atal Behari Vajpayee today said the restrictions imposed by the Election Commission on his movement had hampered his election campaign to a great extent. NEW DELHI, Aug 27  The Nationalist Congress Party today announced to keep itself away from Uttar Pradesh following the failure of seat-sharing talks with the Samajwadi Party for the Lok Sabha elections. HYDERABAD, Aug 27  Congress President Sonia Gandhi will be the partys prime ministerial candidate and there is no ambiguity about it, Andhra Pradesh PCC chief Y.S. Rajashekhar Reddy said today. PATNA, Aug 27  The alliance between the Congress and the ruling Rashtriya Janata Dal in Bihar came under strain today with the former deciding to contest two more seats  Godda and Hazaribagh  in addition to the 14 seats left to it as per their electoral agreement. 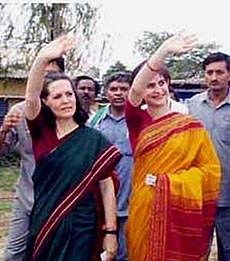 NEW DELHI, Aug 27  Two separate petitions challenging the candidature of Congress president Sonia Gandhi for the Lok Sabha elections on the ground of her foreign origin were dismissed by the High Courts of Mumbai and Madras with the two courts directing the petitioners to pay Rs 10,000 and Rs 5000 respectively as costs. NEW DELHI, Aug 27  Renowned Bharatanatyam danseuse and MP Vyjayanthimala Bali has resigned from the primary membership of the Congress. LUCKNOW, Aug 27  The police were deployed in strength at a village in Ambedkarnagar district of Uttar Pradesh following tension triggered by an attempt to outrage the modesty of a woman belonging to a backward community. PATNA, Aug 27  Rashtriya Janata Dal president Laloo Prasad Yadav will seek re-election from the prestigious Madhepura seat in the Lok Sabha polls from Bihar, where he is likely to be locked in a direct fight with Janata Dal (United) president Sharad Yadav. NEW DELHI, Aug 27  Some prominent Sikh intellectuals and retired officers of the armed forces today asked members of their community to vote for the National Democratic Alliance and accused the Congress of shedding "crocodile tears" on the 1984 anti-Sikh riots and doing nothing to assuage their hurt feelings. NEW DELHI, Aug 27 Senior BJP leader and Union Minister for Human Resource Development, Murli Manohar Joshi today said the party was bound by the agenda of the National Democratic Alliance and there was no scope for raising any contentious issues after the elections. NEW DELHI, Aug 27  The All-India Confederation of SC/ST Organisations and the OBC Minorities Association have decided to protest against the Supreme Court order of putting merit above reservation in super speciality courses. NEW DELHI, Aug 27  The Panthers Party today pledged to liberate Pakistan-occupied Kashmir from Pakistan and work for the creation of a separate state for the Jammu region. JAIPUR, Aug 27  The Election Commission today asked the electorate to behave with national responsibility in the ensuing parliamentary elections so that the 13th Lok Sabha lasts its full five-year-term. NEW DELHI, Aug 27  The Election Commission today turned down a Janata Dal (Secular) plea to cancel the facility of free air time on Doordarshan and All India Radio to the Samata Party and Lok Shakti but directed that their leaders using free air time should not be contesting on any other party ticket. LUCKNOW, Aug 27 (Agencies)  Prime Minister Atal Behari Vajpyee today said the restrictions imposed by the Election Commission on his movement had hampered his election campaign to a great extent. Talking to newsmen at Rajbhawan here he, however, refused to admit that it had an overall effect on the partys campaign throughout the country. Expressing confidence over the partys prospect, the Prime Minister said, the election would not throw up a hung parliament and the National Democratic Alliance (NDA) would get an absolute majority. Asked what would be the strategy of his party if the NDA failed to get a majority and no other party was in a position to form the government, he said such a situation would not arise. To a query about the possibility of formation of a minority government at the Centre and the partys strategy in such an eventuality, Mr Vajpayee said the election manifesto had made some suggestions in this regard. He also underlined the need for a necessary amendment in the Constitution to avoid such a situation. The Prime Minister replied in the negative when asked if the twenty four member National Democratic Alliance could further be expanded after the elections. "Even the Congress has twenty two allies", he quipped. The Prime Minister reiterated that contentious issues like the Ram temple, the common civil code and abrogation of Article 370 were not part of the National Democratic Alliance (NDA) agenda. "Even if BJP as one unit of the NDA gets majority on its own, it would continue to remain part of the NDA and work on the national agenda of governance, "Mr Vajpayee clarified, adding, "There shall not be any confusion on this count". Asked about the impact of the BJP's stand on its allies like Vishwa Hindu Parishad and the Bajrang Dal, the Prime Minister replied that the problem should be "left to us". He asserted that Kargil was a national issue and appreciating the role of the armed forces in flushing out infiltrators from there did not amount to violation of the model code of conduct. "Kargil is certainly a national issue because our brave soldiers gave a befitting reply to Pakistans aggression, achieving victory by flushing them out from our territory and I do not think that patting them for this success is in any way violation of the Election Commissions guidelines, Mr Vajpayee told reporters here. "We are not dragging our armed forces into any controversy or trying to take political mileage out of this in the election. He called upon mediamen to shoulder the responsibility of educating the readership by expressing their views freely and fearlessly, but in a dignified and respectful manner. "Expressing views and thoughts on different events and issues is necessary as providing plain and simple information does not serve the purpose, the Prime Minister said while releasing a Hindi weekly "Pioneer Saptahik here. Mr Vajpayee said the print media had not been affected much by the challenge from television networks as there was no fall in readership. NEW DELHI, Aug 27 (PTI)  The Nationalist Congress Party (NCP) today announced to keep itself away from Uttar Pradesh following the failure of seat-sharing talks with the Samajwadi Party for the Lok Sabha elections. "Complete understanding (on the sharing of seats in UP) has eluded both parties despite our talks for adjustment and we have finally decided not to contest any seat in the state," NCP spokesman D.N. Dwivedi told reporters here. He said the NCP could not find a "mutually acceptable formula" in Uttar Pradesh and ultimately dropped the idea of testing its popularity in the state. Asked if his party would campaign for the SP in the state, he said "a decision would be taken on the basis of our pact with SP in Maharashtra," he said. Party sources said the decision to skip UP was taken as the SP had not only spurned its demand for eight seats, but also refused to withdraw its nominee from Varanasi even after offering the seat to the NCP. Since the NCP saw slim chances of winning the remaining two seats  Almora and Pauri  offered by the SP, it decided to withdraw altogether from the state. Mr Dwivedi said the NCP would contest 39 of the 48 Lok Sabha seats in Maharashtra leaving the rest to its alliance partners including the SP, the RPI (Athawale) and the JD(S). The party also released a list of 16 candidates for Bihar fielding its general secretary Tariq Anwar from Katihar, the seat he won on a Congress ticket in 1998. HYDERABAD, Aug 27 (UNI) Congress President Sonia Gandhi will be the partys prime ministerial candidate and there is no ambiguity about it, Andhra Pradesh PCC chief Y.S. Rajashekhar Reddy said today. Addressing a meet-the-press programme of the Andhra Pradesh Union of Working Journalists (APUWJ) here, Dr Reddy, however, dismissed the question as hypothetical as to who would be the Chief Minister if the party captured power in the state. He said the Congress Legislature Party would decide about it. To another question, he said the APCC chief might or might not take over the stewardship of the state if the party romped home after the polls. He claimed that the party was set to win 220 of the 294 Assembly seats in the state and said there was a downward trend in the fortunes of the ruling Telugu Desam Party (TDP) as the latter could secure majority only in 80-odd Assembly seats as against 150-odd by the Congress during the 1998 Lok Sabha poll. The Congress had won 22 Lok Sabha seats as against the ruling TDPs tally of 12 in the last Lok Sabha poll, he pointed out. Dr Reddy claimed that there was a positive atmosphere in favour of the Congress as the people were looking to the party to provide the much-needed stability. PATNA, Aug 27 (PTI)  The alliance between the Congress and the ruling Rashtriya Janata Dal (RJD) in Bihar came under strain today with the former deciding to contest two more seats  Godda and Hazaribagh  in addition to the 14 seats left to it as per their electoral agreement. BPCC general secretary Prem Chandra Mishra said the party had decided to contest Hazaribagh and Godda seats after the CPI decided to field its candidates against the sitting Congress members Dr Shakeel Ahmed from Madhubani and Rajo Singh from Begusarai severing ties with the RJD. After releasing the list of candidates after clearance by the AICC election committee, Mr Mishra said "The decision to contest two more seats will not jeopardise the agreement. We will contest the upcoming Lok Sabha elections in total agreement with the RJD." Mr Mishra said the party had directed Mr Ishawri Prasad and Mr Furkan Ansari would file nominations from Hazaribagh and Godda constituencies respectively. The names of candidates for Ranchi and Koderma would be announced by tomorrow. The Ruling Rashtriya Janata Dal too announced its decision to contest 36 seats in Bihar for the Lok Sabha elections  two more than its had earlier decided and released the list of candidates for 33 seats. The two seats which the party decided to contest, were earlier allotted to the CPI under the electoral alliance. RJD president Laloo Prasad Yadav told newsmen here today that after the CPI broke the alliance, "we have decided to field candidates from Hazaribagh and Godda seats which were allotted to the left party." He said the names of the candidates for the remaining three seats  Balia, Gopalganj and Khagaria  would be announced shortly. The states ruling party has renominated eleven members of the dissolved Lok Sabha. It has denied nomination to five sitting members in the dissolved house and brought in 14 new faces for seeking election to the Lower House of Parliament. NEW DELHI, Aug 27 (PTI)  Two separate petitions challenging the candidature of Congress president Sonia Gandhi for the Lok Sabha elections on the ground of her foreign origin were dismissed by the High Courts of Mumbai and Madras with the two courts directing the petitioners to pay Rs 10,000 and Rs 5000 respectively as costs. Dismissing a public interest litigation (PIL) in this regard Chief Justice Y K Sabrahwal and Justice S H Kapadia of Mumbai High Court opined that the petition was "totally misconceived and motivated and aimed at gaining publicity in the media". The bench observed that it was forced to award costs of Rs 10,000 on the petitioner, more so, because he was a member of the legal profession who was supposed to be familiar with the laws of the land. The Madras High Court dismissing a writ petition on the issue opined that it was "not maintainable and since the returning officer had already accepted Mrs Gandhis nomination for Bellary constituency, it could not interfere in the matter. The Division Bench comprising acting Chief Justice N K Jain and Justice K Sampath also directed the petitioner to pay Rs 5000 as costs. NEW DELHI, Aug 27 (UNI)  Renowned Bharatanatyam danseuse and MP Vyjayanthimala Bali has resigned from the primary membership of the Congress. In a letter to Congress President Sonia Gandhi, Mrs Bali said that she was leaving the party because she had been painfully watching the party drifting from its avowed principles after the death of Mr Rajiv Gandhi. The party had lost touch with its grassroots and one could see day in and day out that sincere party workers were being steadily ignored. She said the leadership of the party had in recent years and months shown an increasing greed for power, causing instability and immense harm to the country. The Congress should have shown more maturity and solidarity in the national effort on the issue of Kargil, instead of using this occasion to "settle political accounts and personal scores", forgetting that the roots of many of the problems like Kargil could be traced back to the Congress itself. In the letter dated August 24 she said she was finding it "increasingly difficult to justify ourselves to the public and my conscience does not allow me to stay in the party any longer. LUCKNOW, Aug 27 (PTI)  The police were deployed in strength at a village in Ambedkarnagar district of Uttar Pradesh following tension triggered by an attempt to outrage the modesty of a woman belonging to a backward community. A district police spokesman denied a newspaper report that the woman was paraded seminude after she was attacked by three persons at Pakri Bhojpur village on Wednesday. He told PTI on the phone that the incident took place on Wednesday evening when the woman was returning from the market after procuring medicines for her ailing mother. The three persons stopped her on her way back and dragged her to a nearby field with an "intention" to outrage her modesty, the spokesman said. The miscreants were reportedly joined later by three other persons while the victim ran towards her house "seminude", he added. "The victim herself denied that she was raped or paraded naked," the spokesman said adding, however, that she had been referred to the district hospital for medical examination . PATNA, Aug 27 (UNI)  Rashtriya Janata Dal president Laloo Prasad Yadav will seek re-election from the prestigious Madhepura seat in the Lok Sabha polls from Bihar, where he is likely to be locked in a direct fight with Janata Dal (United) president Sharad Yadav. The RJD chief defeated Mr Sharad Yadav from the same seat in the 1998 elections by over 51,000 votes. Both the party leaders had announced their candidature for the seat ending all speculations that either of them would contest from some other place. UNI adds: Union Information and Broadcasting Minister Pramod Mahajan was on Friday criticised by several women academicians, journalists and activists for his reported remarks equating Congress President Sonia Gandhi with Monica Lewinsky. "These remarks transgress all limits of decency and reflect the anti-women mindset of the BJP leadership and their mentors, the RSS, which holds the view that women who oppose their politics and have the courage to confront them are objects of abuse", they said in a statement. They appealed to the citizens to reject all those who held such anti-women views. Among the signatories to the statement were Subhadhra Joshi, Zoya Hasan, Jayati Ghosh, Shabnam Hashmi, Nilima Sheikh, Githa Hariharan, Radhika Menon and Bishakha De Sarkar. NEW DELHI, Aug 27 (PTI)  Some prominent Sikh intellectuals and retired officers of the armed forces today asked members of their community to vote for the National Democratic Alliance (NDA) and accused the Congress of shedding "crocodile tears" on the 1984 anti-Sikh riots and doing nothing to assuage their hurt feelings. "We strongly feel that except shedding crocodile tears on the sufferings of the Sikhs at election time, the Congress has done nothing in concrete terms to assuage their hurt feelings," former Chief Justice of the Punjab and Haryana High Court R.S Narula, who headed the advisory committee to the Chief Minister of Delhi on the 1984 killings, said here. He released a two-page appeal signed, among others by Lt-Gen J.S Aurora (retd) Admiral Satindra Singh (retd) Prof Jaswant Singh Phull, Wing Commander R.S Chhatwal, (retd) Col Monodhar Singh, (retd) and Prof Ajaib Singh. Justice Narula charged Congress with ignoring the reports and recommendations of various committees set up to probe the 1984 riots and also rewarding those indicted in those reports. "The Congress not only ignored the recommendations and reports of the Ranganath Misra and Kusumlata Commissions but also rewarded the culprits by getting them elected to Parliament and giving them high offices in the government and the party set-up. Justice Narula alleged the Congress had patronised "architects" of the 1984 riots like Jagdish Tytler, a party nominee for a Lok Sabha constituency here, and said "the claim of the Congress that Tytler has been given a clean chit by the CBI amounts to rubbing salt into the wounds of Sikhs." NEW DELHI, Aug 27 Senior BJP leader and Union Minister for Human Resource Development, Murli Manohar Joshi today said the party was bound by the agenda of the National Democratic Alliance (NDA) and there was no scope for raising any contentious issues after the elections. Whatever the Prime Minister, Mr Atal Behari Vajpayee, has said is the agenda of the NDA and we are bound by it, Dr Joshi said while addressing a press conference here. Refusing to be drawn into any controversy over the contentious issues, raised by a section of the BJP, Dr Joshi said whatever the Prime Minister has said is the correct stand. Saying that Mr Atal Behari Vajpayee personified Election 1999, Dr Joshi, a former president of the party, said the alliance was fighting the elections under his towering personality. He also refused to comment on a statement of his Cabinet colleague, Mr Pramod Mahajan, wherein he had compared Mrs Sonia Gandhi to Monica Lewinsky. Dr Joshi said he had not seen the statement and he would not comment on it. I do not believe in campaigning where substandard things are said, he added. Dr Joshi, who spoke about his impressions of the election scene after visiting several States during the past several days, said the Congress appeared to be bankrupt as far as its programmes and agenda for the poll were concerned. The Congress must tell people about its programmes, rather than chant about its leaders Indianness, he added. Dr Joshi said the Congress campaigners were criss-crossing the vast Indian landscape like Alice in Wonderland and had nothing to say about the problems of illiteracy, population growth, border security, farmers and the homeless. It is amusing that Mrs Sonia Gandhi has to defensively repeat I love India, he said, taking a dig at the Congress President. He said compared to the Congress, the BJP was talking about the Vajpayee Governments achievements, its literacy programme, food security programme and the role of science and technology in the development and growth of the country. He said the Congress, the Samajwadi Party and the Bahujan Samaj Party has no programme or agenda. Citing the example of the draft nuclear doctrine presented by the government for a debate, Dr Joshi wondered if Mrs Sonia Gandhi understood the intricacies of the doctrine. What are her views on a credible nuclear deterrent?, he asked. On the NDAs agenda, Dr Joshi said after Operation Vijay, we will have Operation Vikas (development) where development would be technology-driven and science and technology would be used for defence and development. Dr Joshi said against the Congress, which was responsible for cutting the defence expenditure, their government would increase budget allocation for the defence sector. The 70-page majority judgement ruled that merit alone can be the basis of selection of candidates for admission to super-speciality courses in medicine and engineering. No special provisions for the purpose are permissible, they being contrary to the national interest, the order said. Commenting on the Apex Courts order, the Chairman of the All India Confederation of SC/ST Organisations, Mr Ram Raj, in a statement said the merit is wrongly perceived and interpreted by them because others are also getting their share. Stating that they would file a review petition, Mr Ram Raj said the SC/ST confederation and the OBCs and Minorities Association would demonstrate outside the Supreme Court on September 1, to get the court to reconsider its order. The majority order of the Supreme Court said at the level of admission to post-graduate courses no special provisions are permissible, since they are contrary to national interest. A common entrance examination, envisaged under the regulations framed by the Medical Council of India for post-graduate medical education, requires fixing of minimum qualifying marks since it is not a mere screening test. Qualifying marks of 20 per cent for the reserved category and 45 for the general category are not permissible under Article 15 (4) of the Constitution, the order said. NEW DELHI, Aug 27 (UNI)  The Panthers Party today pledged to liberate Pakistan-occupied Kashmir from Pakistan and work for the creation of a separate state for the Jammu region. Party chief Bhim Singh, while releasing the manifesto, said we stand for the liberation of all occupied land of Jammu and Kashmir from Pakistan. The party also rejected conversion of the line of control into the international border. While justifying division of the troubled state, Prof Bhim Singh said the party would work for creation of a separate Jammu state on the lines of Uttarakhand. We also fully support creation of a separate Kashmir, as this would help solve the problem being faced by the state. The people of the Ladakh region should be given a chance to decide their future, he added. The party chief claimed that elections were not being held in free and fair atmosphere. More than half a million people had migrated from the state and scores had abandoned their homes in view of the tense situation along the border, he pointed out. The Panthers Party is contesting five seats in Jammu and Kashmir. It will support the Congress nominee for the Ladhar seat. Prof Bhim Singh said that the party will fight 25 seats in the parliamentary elections. We will extend support to those parties which fight communal and corrupt elements, he added. He also favoured identity cards in the state. The manifesto also recommended drastic changes in the constitution so that the illiterate, communal and corrupt persons could be barred from contesting elections. The Member of Parliament should be a graduate, it added. JAIPUR, Aug 27 (PTI)  The Election Commission today asked the electorate to behave with national responsibility in the ensuing parliamentary elections so that the 13th Lok Sabha lasts its full five-year-term. A yearly election is like a yearly pregnancy. It weakens the country and erodes peoples faith in Parliament. Therefore, I appeal to the people to behave with national responsibility so that the next Parliament completes its full term, Election Commissioner G.V.G. Krishnamurthy said at a press conference here. It is the responsibility of all of us that we assess all the parties and candidates in the fray properly and vote for those who could take the country forward with stability, Mr Krishnamurthy said. Advocating electoral reforms, he said despite the Commission seeking the same, nothing had been done, he said. However, the Election Commission had taken up some measures for electoral reforms under its jurisdiction like making it mandatory for each candidate to file an affidavit stating his past criminal record. Because of this the number of candidates with criminal records fell steeply from 1500 in 1996 polls, to only 150 in the 1998 polls. Mr Krishnamurthy said the election process in the country was the most challenging in the world as a 62 crore electorate participate in it for whom about eight lakh polling stations were set up. He said about 45 lakh personnel would be engaged in the conduct of elections this time. Elections are being held in five phases because the required number of personnel of paramilitary forces were not available this time due to the Kargil situation. It is an unavoidable administrative inconvenience because we cant ignore security along the countrys borders. He expressed regret that despite the Commissions pleas, delimitation of parliamentary seats could not be held creating a piquant situation in which on the one hand the Lok Sabha constituency of Outer Delhi has 28 lakh voters, while Lakshwadeep had barely 40,000 voters. For the first time a shelter will be provided near every polling station where voters can rest. In addition to providing drinking water and first aid at polling stations eating stalls would also be permitted at a certain distance. Eatables would not be free at these stalls, he said. The Janata Dal (S) headed by former Prime Minister H.D. Deve Gowda had asked for the withdrawal of free air time facility to Samata and Lok Shakti on the ground that these two parties had merged with the Janata Dal (United) led by Mr Sharad Yadav. The Election Commission in its order noted that the Lok Shakti and Samata Party had stated in their replies to the JD (S) plea that they continued to exist as separate parties and had not formally merged with the JD (U). The Commission has decided that the time allotted to these parties for their political telecast/broadcasts will continue to remain allotted to them, so long as they continue to exist as separate recognised political parties under the election symbols order 1968.